27 days, 7 hours and 43.2 minutes in duration. The period from one new Moon to the next new Moon is 29 days,12 hours and 44.05 minutes. The Moon has a surface area of 14,670,000 square miles and The surface gravity is 1/6 that of Earth . Scientist estimate that the Moon has half a million craters that are more than 1 mile wide. The Largest craters are rimmed by mountains and have steep, terraced walls. The temperature at the equator can be 260 0 F. with the Sun at zenith to a low of minus 280 0F. during a lunar night. 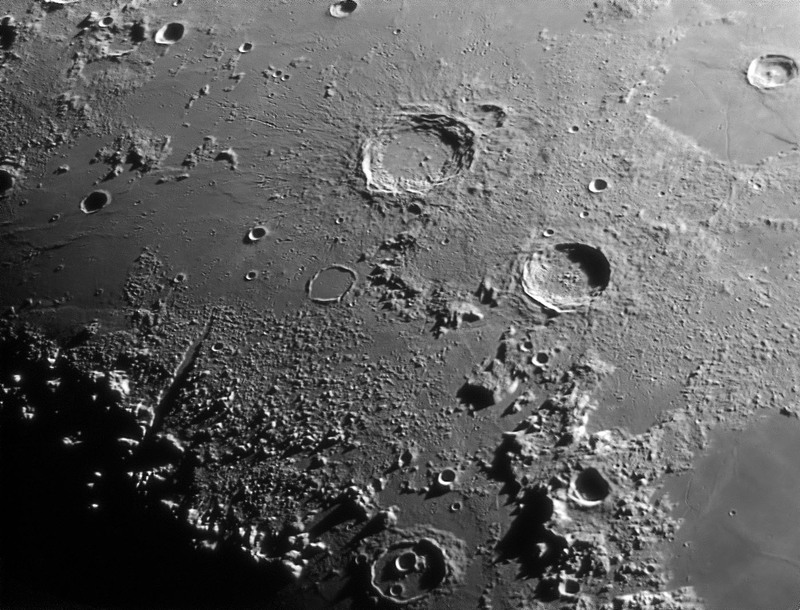 The largest crater, the "Imbrium Basin", is about 700 miles wide. The mountainous areas of the Moon are scattered with huge craters. The "Apennine Mountains", near the "Sea of Rains", rise to about 20,000 feet above the surface. The "Leibnitz Mountains", near the Moon's south pole, rise to about 26,000 feet high. They are almost as tall as the highest mountains on Earth. Click here to see a close up of the Moon.